On last night’s WWE Monday Night Raw, John Cena, the most marketed personality of the performance sport’s premiere stage, showed that the damage done in the ring can be very real. Despite his nose being brutally smashed and left looking like a pug, he proved that the show must go on. Serving as last night’s main event on the WWE’s perennial cable flagship show Monday Night Raw, Cena put his middle-tier United States Championship title on the line, taking on the top-tier WWE World Heavyweight title holder Seth Rollins. In true villainous “heel” fashion, Rollins has been using conniving trickery and the power of the company’s big brass known as “The Authority” to extend his misbegotten title reign. It was a true tale of the cruel, craven, King Joffrey-like champion trying to take what the determined hero proudly had, despite already owning the top prize in the business. Storyline aside, Rollins’ undeniably amazing athletic abilities as a performer were on full display in this match. However, one such devastating demonstration included a flying knee aimed at the face of John Cena that found its mark a little too well for the performance. As it often happens in pro-wrestling when legitimate injuries occur, there was a noticeable dilatory break in the pacing of the action as the officials and Cena himself assessed the extent of the damage. 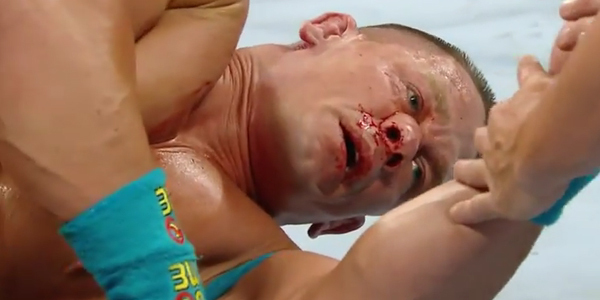 However, while Cena is not currently the main champion, he is still the poster boy of the image-conscious company and sets quite the example by continuing on with the match, despite his nose being turned into a bloody, flattened mess. It’s a dramatically non-ideal sight, considering the company’s current “PG” direction, but one that’s nevertheless necessary. This is hardly the most gruesome or debilitating injury that has ever occurred in pro wrestling’s squared circle over the years. Names that will never achieve the household level of Cena’s have suffered a variety of broken bones, ripped ligaments and even long-term brain damage. However, when such incidents happen to a hugely popular, highly visible multimedia superstar such as Cena, it tends to become a teachable moment to broader audiences about the grittier aspects of the wrestling industry. With Cena especially visible these days - being memorably hilarious in a current big screen run as Amy Schumer’s jacked-up narcissistic hookup in the film Trainwreck - it drives home the point that what all wrestlers do in the ring, while obviously being a performance, is nevertheless part of a perilous profession. Thus, the well-known fact that the “fake” sport of professional wrestling is a scripted, intricately choreographed action spectacle might be amended to appreciate what the job physically entails, rather than being some factoid that non-wrestling fans indulgently believe to be some bombshell of a secret. That appreciation can potentially continue by watching WWE Monday Night Raw when it airs year-round on Monday 8 p.m. EST on USA.